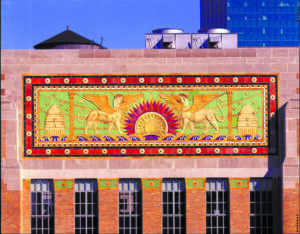 Susan Tunick is an authority on terra cotta, an artist in the medium and president of Friends of Terra Cotta. She is the author of Terra-Cotta Skyline, Paris and the Legacy of French Architectural Ceramics and Terra Cotta…Don’t Take It for Granite. She was guest curator for “Uncommon Clay: New Jersey’s Architectural Terra Cotta Industry” at the Middlesex County Museum (2002-03). Her work as an artist working in clay includes murals in PS 222 in Jackson Heights, Queens and sculptures in the Hudson-Bergen Light Rail Station in Bayonne. The Margot Gayle Fund for the Preservation of Victorian Heritage, established in 2008, enables the Metropolitan Chapter to make monetary grants for projects for preservation or conservation of Victorian material culture in the New York Metropolitan area.